A beautifully-presented half-bottle of Camus Josephine - a cognac designed by this famous producer specifically to appeal to feminine tastes. Nose (86): more than average. nuts, citrus, lemon zest, grapes. Smells more like a Jerez brandy than a cognac. And that's a good thing for me. Palate (88): powerful. nuts, lemon, citrus, spices, pepper, cinnamon, floral. Interesting. Finish (85): average. honey, nuts. So based on other whiskies I have already tasted I rate this Camus Josephine Cognac with 86 points over 100. The whisky was created taking Black Label as a blueprint and adding heavily-peated malts and some aged in deeply charred oak casks. It is a "limited" release. Nose (85): average. honey, floral, vanilla. Young! WTF! The same smell that Red Label has! Palate (86): light. honey, floral, citrus, smoke. Finish (86): average. honey, smoke. So based on other whiskies I have already tasted I rate this Johnny Walker Double Black with 86 points over 100. Nose (91): strong. honey, floral, wood, fruity, pears, spices, cinnamon, vanilla. Simply amazing! It's hard to believe it is only 12 years old. Palate (91): powerful, oily. honey, spices, vanilla, wood, cinnamon, cocoa, pepper. Finish (90): longer than average. honey, floral, wood. So based on other whiskies I have already tasted I rate this Suntory Yamazaki 12 year with 91 points over 100. A long awaited 40 year old whisky from Bunnahabhain, a bit hit at The Whisky Show 2012. Nose (94): more than average. floral, lavender, honey, cinnamon, candies. Palate (93): dry, powerful, oily. floral, honey, pepper, wood, candies. Marvelous! One of the best old whiskies I have ever had. Finish (93): longer than average. honey, floral, flowers. So based on other whiskies I have already tasted I rate this Bunnahabhain 40 year with 93 points over 100. The first ever heavily peated whisky from the English Whisky Company - the only distillery in England, based in the town of Norfolk. Nose (90): more than average. peat, honey, citrus. Palate (89): powerful, oily. peat, citrus, honey, floral. Very nice taste. Love the way peat plays in this whisky. Finish (89): longer than average. peat, floral. So based on other whiskies I have already tasted I rate this St. George Chapter 11 with 89 points over 100. A wonderful example of what Japanese whisky is capable of. We absolutely love this. Extremely smooth, with great complexity and a lovely balance of fruit, silky malt and a touch of smoke. Nose (91): more than average. nuts, honey, varnish, citrus, floral. Stunning nose! A legendary sherry monster! Palate (91): powerful, oily. honey, nuts, a little sulphur, leather, citrus, wood, floral. In this whisky the sulphur note is even a positive thing. I like how it works there. Finish (91): longer than average. honey, nuts, pepper. So based on other whiskies I have already tasted I rate this Suntory Yamazaki 18 year with 91 points over 100. A 14 year old whisky distilled at Balvenie distillery, matured in casks which previously held Caribbean Rum. Expect vanilla and toffee notes. Nose (89): average. honey, vanilla, pepper, candies. Palate (90): smooth, oily. honey, vanilla, anise, smoke, pepper, candies, citrus. Finish (90): longer than average. honey, floral, vanilla. So based on other whiskies I have already tasted I rate this Balvenie 14 Year Old / Caribbean Cask Speyside Whisky with 90 points over 100. A VSOP style blend of around sixty eaux-de-vie aged between four and ten years, this is a stylish cognac equally at home in a quality cocktail or as a digestif. Excellent value for money. Palate (86): powerful. lemon zest, caramel, spices, floral, grapes, pepper. Tastes very much like a rum. Finish (86): longer than average. honey, burnt sugar, lemon zest. So based on other whiskies I have already tasted I rate this Hennessy Fine de Cognac with 86 points over 100. A perennial favourite and a must-try for anyone interested in discovering Japanese whisky. Hakushu is owned by Suntory, founders of the first Japanese distillery, Yamazaki. The original Hakushu distillery was built in 1973, with another distillery building called Hakushu Higashi (west) added in 1981. Nose (89): more than average. honey, floral, citrus, peat, wax. Interesting but more subtle than Yamazaki. Palate (89): powerful, oily. honey, floral, wood, spices, pepper, vanilla, smoke, citrus. Nice. Really complex taste. Finish (89): longer than average. honey, citrus. So based on other whiskies I have already tasted I rate this Hakushu 12 year with 89 points over 100. The exclusive new Chivas Regal 25 pays homage to the first ever Chivas Regal blend. This first Chivas whisky was also a 25 Year Old whisky, which was shipped from Aberdeen, Scotland to New York in 1909 to satisfy the sophisticated palate of American high society. It quickly became the most talked about tipple of distinguished Americans and developed into a global icon. You are paying a hell more than the whisky is worth just to the beautiful bottle and the awesome box but who can say no to this?! Nose (91): more than average. honey, citrus, floral, smoke, vanilla. Palate (92): powerful, oily. honey, oranges, citrus, floral, vanilla, smoke, pepper. Finish (90): longer than average. honey, peat, vanilla. So based on other whiskies I have already tasted I rate this Chivas Regal 25 year with 91 points over 100. I tasted this Single Malt whisky from Bunnahabhain The Whisky Show 2012 in London just after tasting a nice 18 years old sherry monster and close before tasting the amazing new Bunnahabhain 40 years old. Bunnahabhain 25 year old is delivered in the smoked oak glass bottle but its labelling is on aged parchment and it finds its bed in an Alder wooden box lined with Hessian and closed with solid brass fittings. Nose (92): more than average. honey, smoke, citrus, floral, spices, vanilla. Palate (92): powerful, oily. honey, peat, fruity, citrus, salt, wood, cinnamon. Finish (92): longer than average. honey, salt, citrus. So based on other whiskies I have already tasted I rate this Bunnahabhain 25 Year Old with 92 points over 100. Teerenpeli distillery was founded in 2002 at the brewery of the same name in Lahti, Finland, and the name means 'flirtation' or 'dalliance'. We tried this 8yo at Whisky Live and were knocked out at how balanced and tasty it was - this is a very well-made whisky and is destined to be a huge hit. Nose (86): more than average. honey, herbs, pepper, citrus. Slightly newmake but still nice. Palate (87): powerful. honey, pepper, ripe fruits, floral, mineral. Finish (85): average. honey, mineral, floral. So based on other whiskies I have already tasted I rate this Teerenpeli with 86 points over 100. 75cl / 43% - This is the oldest in the Ballantine's range of quality aged Scotch Whiskies and is available only in very limited quantities. Palate (89): smooth. honey, pepper, citrus, vanilla, liquorice, wood. Finish (89): average. honey, pepper, floral. So based on other whiskies I have already tasted I rate this Ballantines 30 Year Old with 89 points over 100. 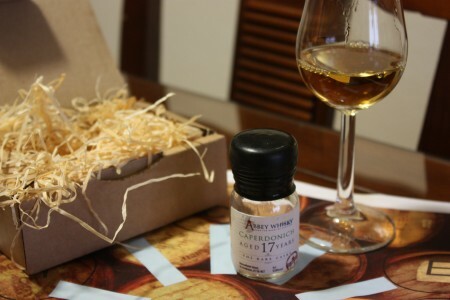 A few weeks ago Abbey Whisky, a family run business founded in 2008 specialises in exclusive, rare and old whiskies, sent me a sample of Caperdonich 17 years old of their Rare Casks series. ever more unlikely that the Caperdonich distillery will ever be reopened again. Anyway, while there are stills, there is hope! Enough history for today, let’s taste this whisky. A single cask Rosebank 21yo bottled by The Whisky Exchange with one of our stylish retro labels inspired by classic whisky designs from days gone by. This one is from an ex-bourbon cask and is delightfully sweet and elegant, even if we do say so ourselves. Nose (91): more than average. honey, vanilla, floral, malt. Palate (92): powerful. honey, oranges, citrus, fruity, pepper. Awesomely nice. Finish (91): longer than average. honey, pepper, wood. So based on other whiskies I have already tasted I rate this Rosebank 21 The Whisky Exchange with 91 points over 100. This one is another crack that I tasted in my last visit to London and it was also my first Karuizawa. Keep in mind that there is three different bottles of this one around: an Asama 46%, Asama 48% and an Asama 55%. I tasted the 48% abv bottling. So the whisky. This one is a vatting of several Karuizawa casks distilled between 1999 and 2000, so 12 years old Karuizawa for £60… it could be worse. A TWE exclusive release of Karuizawa, a vatting of about 70 casks bottled at 48% to produce a well rounded and affordable example of the distillery's character. Nose (89): more than average. honey, nuts, citrus. So based on other whiskies I have already tasted I rate this Karuizawa Spirit of Asama / 48% Japanese Single Malt Whisky with 89 points over 100. I tasted this single grain whisky with Fred Laing at The Whisky Show 2012 in London and so transcendental the experience was that I had to buy a bottle for myself. If you have never tasted any Clan Denny Single grain you really should. It is still fairly priced and shows awesome complexity of very old whisky. 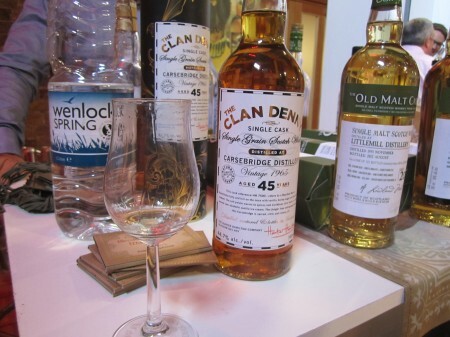 70cl / 44.7% / Clan Denny - A 1965 vintage grain whisky bottled by the grain lovers at Clan Denny. This matured for 45 years and lasted longer than the Carsebridge distillery, which was one of the many distilleries mothballed in 1983 and was dismantled in the early 1990s. Nose (92): strong. honey, corn, vanilla, wood, flowers, parma violets. Palate (93): dry, powerful. honey, flowers, candies, vanilla, wood. Finish (93): longer than average. honey, corn, flowers. So based on other whiskies I have already tasted I rate this Carsebridge 1965 / 45 Year Old / Clan Denny Single Grain Scotch Whisky with 93 points over 100. A special Christmas edition of Big Peat Islay blended malt whisky. Big Peat is made by vatting whisky from only Islay distilleries: Ardbeg, Bowmore and Port Ellen inside this one. This special edition has been bottled at Cask Strength and has had its label and presentation tube festively redesigned. Nose (91): strong. peat, honey, citrus, vanilla, earth, coffee. Palate (91): powerful, oily. peat, honey, citrus, earth, coffee. Finish (91): longer than average. peat, pepper, honey. So based on other whiskies I have already tasted I rate this Big Peat Blended Malt / Christmas Edition 2012 Blended Whisky with 91 points over 100. I was at London just a few months ago for TWE Whisky Show and as I arrived too late for entering the show I decided to grab my camera and walk a bit around. 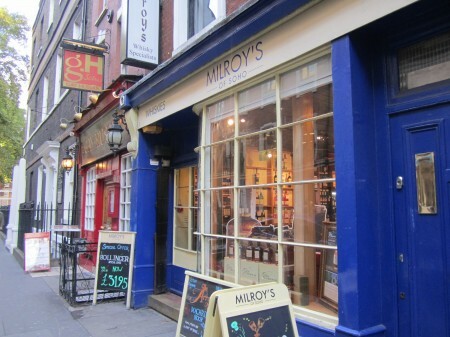 Talking with some friends they told me not to miss Milroy’s of Soho and so there I was. While I was on the shop I noticed, between the hundred of awesome whisky bottles, a few single cask bottlings by Milroy’s. To buy or not to buy. That was the question. Nevermind Ryanair replied it for me as I was traveling with hand luggage only ( stupid security rules! ) and I would be force to either drop or drink the bottle at the airport. 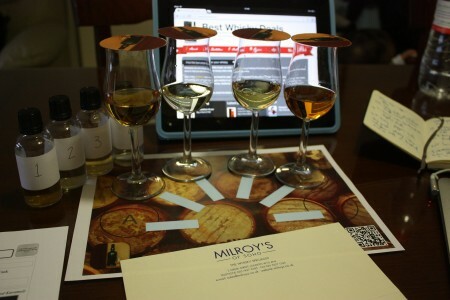 So you can understand my joy when Steve Rush announced a Milroy’s Tweet Tasting ( Who of you prefers twasting? ) for Dec, 12th and I was told I were to join fellow bloggers in it. So Gentlemen! ( and Ma’am! ) Pour your drams! 70cl / 46% - The ne plus ultra from Jameson, this has been blended with some of the oldest and rarest whiskeys from Jameson's maturing stock - one of which was a pot-still whiskey matured in a port pipe, which adds an extra fruitiness to the final assemblage. More than justifies the price tag - this is one of the greatest Irish whiskies ever bottled, we feel. Nose (87): strong. honey, floral, vanilla. Palate (89): powerful. honey, floral, spices, vanilla, citrus. Finish (88): longer than average. honey, floral. So based on other whiskies I have already tasted I rate this Jameson 2007 Rarest Vintage Reserve Blended Irish Whiskey with 88 points over 100. When I was visiting London for The Whisky Exchange Whisky Show I tasted this whisky with Surrinder Kumar. And I tasted it after 40 whiskies, Talisker 35 years old, Carsebridge 45 years old and some of the best Karuizawa I have tasted! Imagine how good it has to be to stand after all that. Amrut Intermediate Sherry Matured is uniquely different from the usual sherry finished or sherry matured whiskies. It is the first �intermediate sherry matured� whisky � with the malt aged in sherry casks between periods maturing in either bourbon or virgin casks at Amrut�s Bangalore distillery. Nose (90): more than average. honey, malt, citrus, nuts, vanilla. Palate (91): powerful, oily. honey, malt, citrus, nuts, cocoa, vanilla. Finish (91): longer than average. honey, nuts, vanilla. So based on other whiskies I have already tasted I rate this Amrut Intermediate Sherry Matured with 91 points over 100. A 20 year old single cask Bunnahabhain bottled by Douglas Laing as part of their shiny Directors' Cut range. 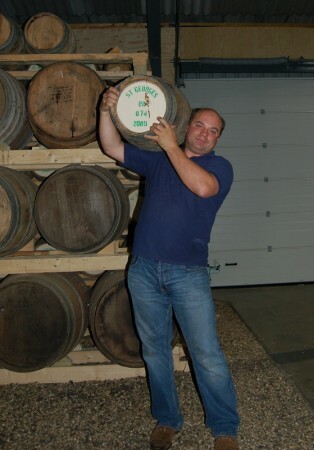 Distilled in December 1991 and bottled in December 2011 after sitting in a refill hogshead. Nose (88): more than average. peat, honey, citrus. Palate (89): powerful, oily. peat, honey, citrus, fruits, wood, spices, liquorice, coffee. Finish (88): longer than average. peat, pepper, liquorice. So based on other whiskies I have already tasted I rate this Bunnahabhain 1991 / 20 Year Old / Directors' Cut Islay Whisky Douglas Laing with 88 points over 100. Principe Brandy: So good and so cheap? Amber color. Aroma of wood, with notes of pastry. In the mouth, sweet tones, slightly hot. Nose (86): more than average. lemon zest, raisins, burnt sugar, spices. Palate (87): powerful. nuts, fruits, cocoa, raisins, oloroso, lemon zest. Finish (87): longer than average. nuts, cocoa. So based on other whiskies I have already tasted I rate this Principe Brandy Reserva Especial with 87 points over 100. I tasted a very nice St. George English Whisky, well, not a whisky yet in fact, a few years ago when doing a vertical tasting of Ardbeg whiskies. I was really ashtonished by the awesomeness of that spirit and I have been since then willing to taste new whiskies from this distillery. 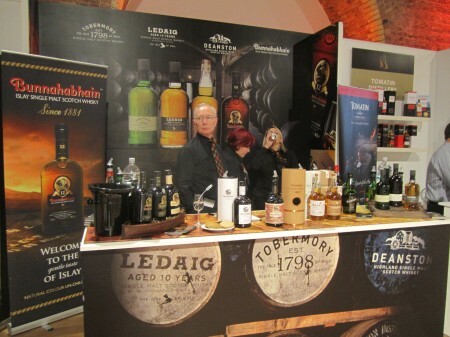 My chance appeared at The Whisky Show 2012 in London, where English Whisky Co has a shared stand with Amrut showcasing some of their whiskies. With a few days of delay here they are! Malt Maniacs Awards 2012. Ten judges, almost two hundred numbered samples, two months, only ten Gold medals. In case you didn’t notice, Pl1 got a Gold Medal at Malt Maniacs Awards 2012. I think it is the first time I see such an affordable whisky with a Gold in these awards. This was the very first bottling of Speciality Drinks of Port Charlotte whisky. This super peated whisky distilled at Bruichladdich distillery is fully matured in an awesome sherry cask. For sure this whisky isn't old but it does its job extremly well. Nose (89): more than average. peat, honey, wood, citrus. Palate (89): dry, powerful. peat, honey, citrus, earth, floral. Finish (89): longer than average. peat, nuts. So based on other whiskies I have already tasted I rate this Pl1 - Elements of Islay Islay Single Malt Scotch Whisky with 89 points over 100. 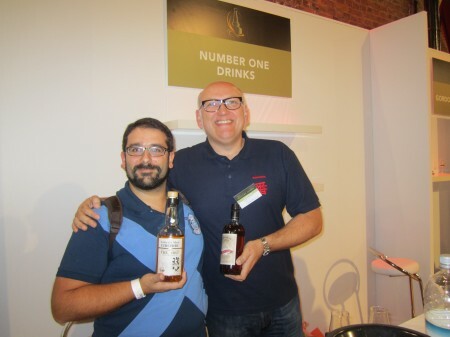 During the last WhiskyLive Madrid, Fran Peregrina invited me to visit Destiler�as Liber, a small malt whisky distillery that are responsible for the first single malt spanish whisky that it is born just under Sierra Nevada in Granada, Andaluc�a. 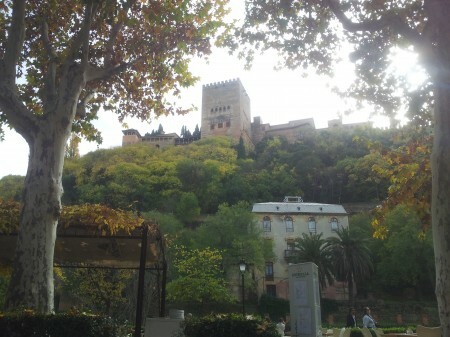 A few weeks ago I found a free work day and I decided to visit Granada and visit the distillery that it is just ten minutes far from Granada. They accept visits with a booking at info@destileriasliber.com. So this was my experience there. Bunnahabhain is the most subtle whisky of Islay, with is unpeated malt it really departs from the peated consensus that rules the island. But don’t let this turn you down. 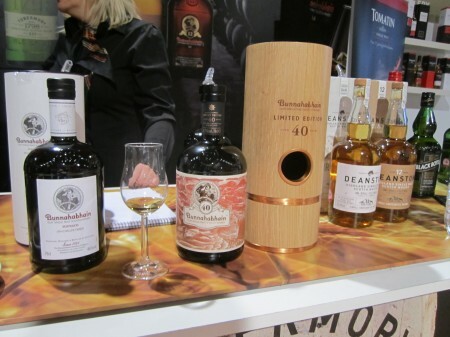 Bunnahabhain single malts are among the best I have had and at the The Whisky Exchange Whisky Show I had a chance of tasting some very exclusive ones. As I was in a real hurry that day, I have now added at home a few Bunnahabhain whiskies more that I really wanted to taste but I wasn’t able.